Wishes don’t always come true, yet when it does… it is even more special. Recently we learned that a special Make-A-Wish recipient’s dream is coming true as he is sent off to a Packers game to meet players. The Barton Creek Resort & Spa and Make-A-Wish Central and South Texas presented Wish Kid Wray, a 16-year old who is battling Burkitt’s lymphoma, with a trip to the Green Bay Packers game in Green Bay, WI this November. Barton Creek is making Wray’s wish come true as part of the resort’s commitment to the Make-A-Wish Central and South Texas. 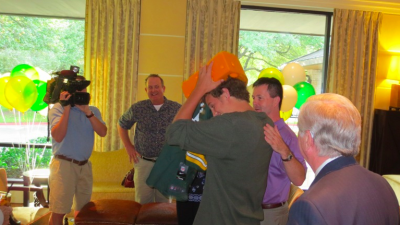 Barton Creek’s General Manager James Walsh presented Wray with an official Green Bay/NFL jersey of his favorite player and cheese hat head to wear to the game. 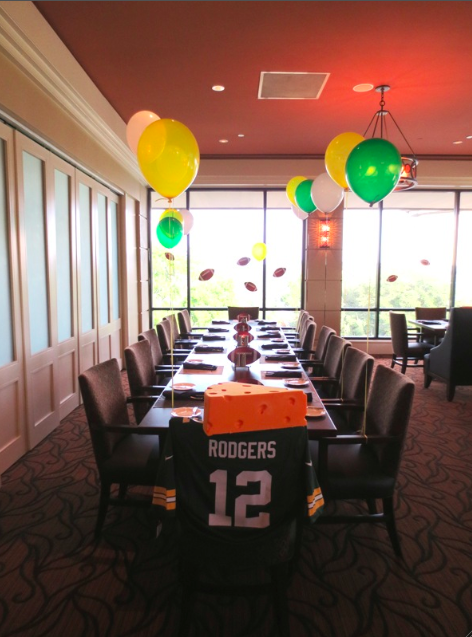 Wray’s wish granters reveled in the excitement that lies ahead during his trip to Green Bay and themed decorations including Green Bay colors, a Green Bay branded cake and Green Bay-inspired appetizers, of course.